We’re always excited to see architects reuse industrial materials, and in the prefab world there’s no match for the simplicity, low cost, and customization capabilities of the stalwart shipping container. We’ve covered several ways that architects have up-cycled the durable containers into industrial-chic living spaces, and this incredible home in Wellington, New Zealand, is the latest container redux to catch our eye. Composed of three slate grey containers stacked up like blocks beside a hilltop, it strikes the perfect balance between ruggedly engineered construction and clean modern form. Shipping containers are an intrepid green architect’s dream. They’re essentially durable, ready-made rooms that, with the right set of retrofits, can be repurposed into modular living spaces. Built to weather the test of time and strains of shipping, they also possess a standardized modular structure that gives them great potential for vertically inclined projects. 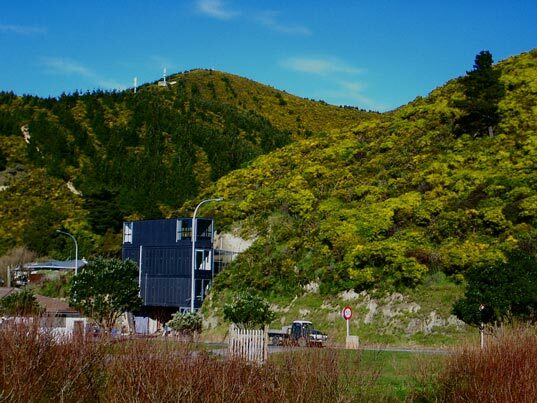 The grey container house was constructed by Ross Stevens, an Industrial Design lecturer at Victoria University in Wellington. It takes advantage of the shipping container’s intrinsic stacking ability to build where other construction methods would have been costly, if not altogether impossible. The house is composed of mostly reclaimed materials, and it has a wonderful way of merging its industrial interior with the immediate environment through balconies and terraces. If you are serious about building your own Container home, the best thing to do gain membership at www.containerhome.info these guys have done their homework, tutorials for every step. Enjoy! Hi, I am a Wellingtonian who cares about the environment and absolutely love the concept of container homes. Can I get more info on how I could construct a similar home for myself and if I can see the house. Please, if anyone has any ideas on container home designs in NZ. Also to use a green roof and as much recycled materials for the interior as well. Thank you. The earthquake was in Christchurch which is in the south island of New Zealand. Wellington is at the bottom of the north island, (real creative names for the two main islands - we need to change them) I understand that Wellington housing stock suffered no damage of any significance from the Christchurch quake, so I would expect the house to be undamaged, and I would expect the nearby traditional houses to also be undamaged. the interior is amazing, i love how they kept the industrial modern feel of the containers instead or trying to make it look like a "normal" house. unfortunately the outside is totally bland. i don\'t mind the look of shipping containers, but where are the windows? diego- it's too bad you are talking about something you don't know. this house actually is sited right next to a busy road, and is not on a cliff. and on the other side of that hill behind the house? The regional landfill. Next to it? Across the road? a bland suburban development. This place and the quirky place of the guy who does sculptures out of junk are the only interesting parts of the drive until you get to the waterfront which is another 5 km away. We're always excited to see architects reuse industrial materials, and in the prefab world there's no match for the simplicity, low cost, and customization capabilities of the stalwart shipping container. We've covered several ways that architects have up-cycled the durable containers into industrial-chic living spaces, and this incredible home in Wellington, New Zealand, is the latest container redux to catch our eye. Composed of three slate grey containers stacked up like blocks beside a hilltop, it strikes the perfect balance between ruggedly engineered construction and clean modern form.